Indulge yourself with this delectable sun-dried tomato herb dip. Infused with ultra-flavorful tomatoes and fresh herbs, this dip helps you take midday veggie-munching to a new level. 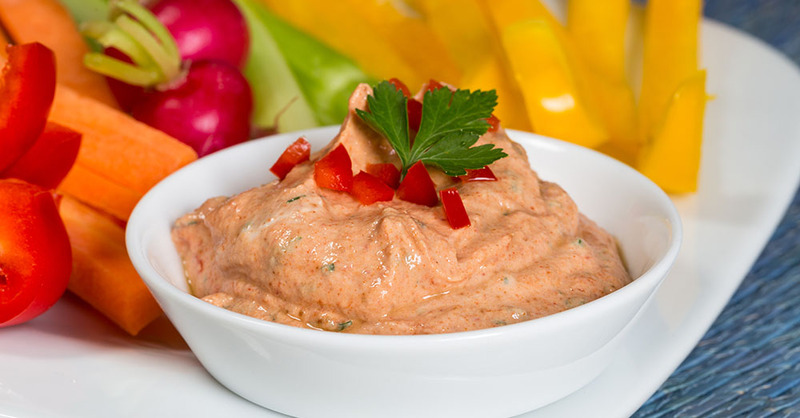 Perfect when paired with celery sticks, carrots, sliced tomatoes, and crackers or bread, this colorful dip entices everyone in your home to enjoy a wholesome, nutritious snack. Easy to pack and take with you to work, this dip is also great for keeping you satiated throughout your daily grind. This dip doubles as a refreshing way to liven up baked fish or chicken. Surprise and delight your family by heating the dip slightly, then dropping a dollop of it over each main dish portion right before serving! Place sun-dried tomato halves in medium-sized saucepan, and cover with water. Simmer over medium-low heat for approximately five minutes, or until water evaporates. Add sun-dried tomatoes to a food processor or blender along with all other ingredients, and process until smooth. Refrigerate for one hour or until chilled. Garnish with additional chopped sun-dried tomatoes and parsley if desired, and serve with bread, crackers, or veggie sticks.